Chick Lit Central: Let me tell you about a dream I had recently . . .
Let me tell you about a dream I had recently . . . 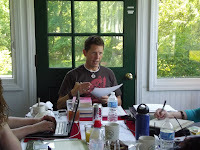 The dream started this past February, when someone e-mailed me a link about a Writers' Retreat led by Wade Rouse in May. 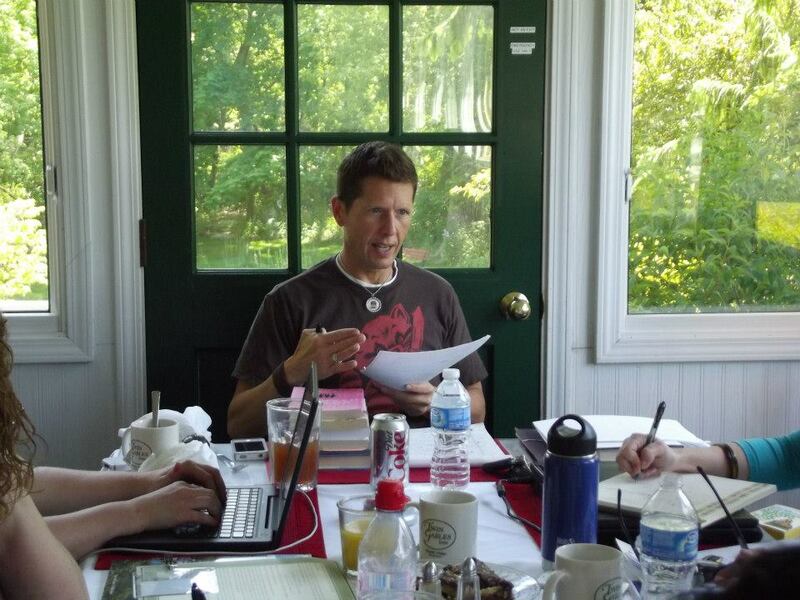 The retreat was in the picturesque setting of Saugatuck, MI. 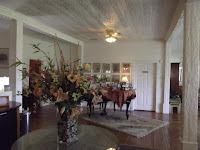 For a while, I wasn't sure if I was going to attend this retreat because though I blog on a regular basis both for Chick Lit Central and my own personal blog, I never really thought of myself as a writer. Sure, I had toyed with the idea of writing a book, someday, but who was I kidding??? Fast-forward to a month later...I'm not sure what had changed between February and March (remember, this is a dream), but whatever it was, I decided to go to this retreat. I figured, at the very least, it would be a much needed escape from my day-to-day life, and a chance to catch up on some writing I've been wanting to get done but never seemed to have the time to finish. So, I signed up for the retreat. Before I knew it, my dream had me packing my bags and making my way to Michigan early one Thursday morning in May. When I arrived in Saugatuck, I was in awe of the charm this small town had to offer - it truly was picturesque! 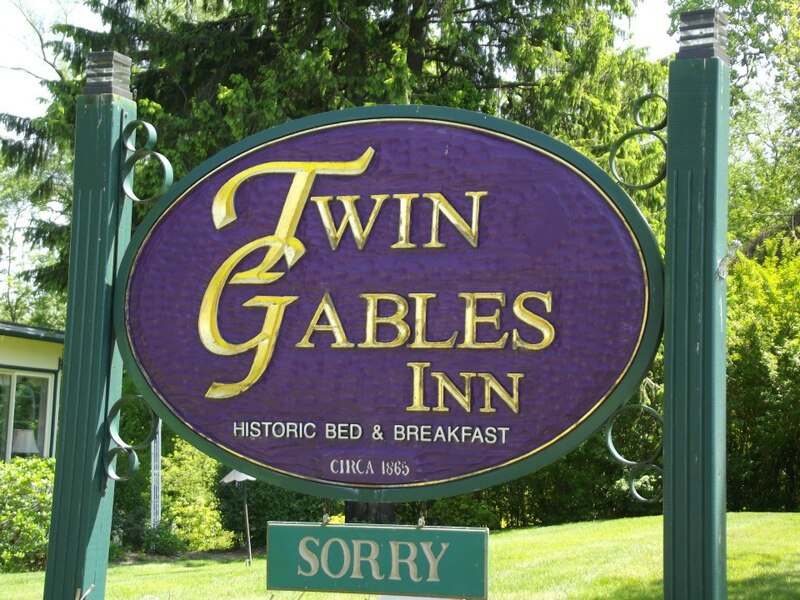 My Saugatuck destination was the Twin Gables Inn where the writing sessions were being held, and I would also be staying for the next three nights. Since I had arrived a few hours early, I took at brief walk into town and around the Twin Gables grounds. This included sitting on one of the rocking benches by the fire pit that adorned the grounds. This is where I took a few moments to truly soak in where my dream had taken me. That evening, I met Wade Rouse (whom up to that point I knew very little about except for the fact that he was an author a friend of mine spoke very highly of) and his partner, Gary, along with the other retreat attendees. As we snacked on appetizers and drank lots of some wine, we chatted about everything from who we were and our experience with writing to our favorite books and authors. I listened intently, taking in everything that was going on around me. I was delighted that the group seemed to get along so well from the beginning. After an impromptu trip to the beach to see the sunset, we all parted ways for the evening. The plan was to reconvene bright-and-early the next morning for breakfast and then start our sessions. That morning, after a run along the lake shore, I got ready for breakfast and the day ahead. "Come to breakfast hungry, you're going to have a fantastic three-course meal served to you," Gary and Wade had advised us the night before. So, I made sure I was hungry. I can't remember exactly what we had that first morning (or any of the other morning for that matter), but it was in fact quite yummy and filling. This would be the first of many delicious meals we had at the inn. After we finished our breakfast that first day, we had two assignments. The first I'll leave as a mystery, just in case you one day decide to have a similar dream. The second, however, was to write about what we're most afraid to write about. At this point, I was hoping I'd wake up from my dream because, quite frankly, this exercise really scared the crap out of me. It didn't take me long to figure out what I was most scared to write about; however, it did take me a moment to accept I had to write about it, and even worse would have to read my piece out loud to the group. Once we received our task, we were given an hour to write. So I took my laptop and curled up in a comfy green chair located in the corner of the main foyer area. When we all came back together, it was time to read to the group what we had written. (Again, waking up at this point would have been ideal, as the idea of reading anything I've written out loud makes me squeamish. Let's just say I'm not a "look at me" type of person; personally I'm much happier staying out of the spotlight. It was hard enough for me to complete this assignment, but to share it with others was even more terrifying for me.) The mood in the room was kind of like being back in school. You knew at some point you were going to have to speak, it was just up to you whether or not you did it on a voluntary or non-voluntary basis. With that in mind, I volunteered to go second. I was no more than two words in, when my voiced cracked and I asked someone else to read what I had written. (Yep, that's right! I was the crier of the group.) The person sitting next to me was happy to do so I pushed my laptop over her way. This arrangement didn't last long because I forgot to tell her my screen goes into sleep mode if you don't move the mouse periodically. She had problems reading the screen, as a result. So, I took my laptop back, regained my composure and began to read what I had written. (This was probably a good thing anyhow. At this point I figured if I was going to give voice to my story I might as well have made it my own.) I have to admit, after I was finished I wasn't scared anymore of what I had written; instead I was now scared of the feedback I was about to receive. After a slight pause, Wade praised my work and shared with me all the reasons why he liked it so much. Also, he shared with me all the different ways I could develop what I had written into a book. After we were done talking about my work, the remainder of the individuals read their pieces. I was captivated by everyone's stories. Actually, I was so captivated that time just passed by. Before we knew it lunch time had arrived... "Oh good!" I thought to myself, "After such a tough morning, yummy food was most welcome." (Yes, if you haven't figured it out by now, I like to eat.) The remainder of the day was spent talking about finding our voice. Hmmm ... I'm a talker type person so I thought the whole conversation about "finding our voice" might be moot for me, but Wade wasn't talking about "voice" in that way. What he wanted to share with us was how to find our writing voice. The day ended with a lovely dinner with Wade, Gary and my fellow writers. My dream continued with a second full day of the retreat. This day was broken up into two parts - the "work" portion and the "play" portion. In the morning, we had a session on publishing as a business. This conversation got down to the nitty-gritty of the "how to's," such as "How to pitch your book to an agent," "How to market your book once it is published," "How authors really make money off their published works," etc. The group even got to speak with a first-time author to learn more about the process, and hear about what happens "after" you get a book deal. I have to admit, though informative, this part of the retreat does shatter my little bubble that all you have to do is sell your work to a publishing house and you're golden. (Oh well, next!) Once that bubble was broken, I picked up the pieces and diligently took notes. Never hurts to get a head start, right?! The second half of the day, Gary went out with the group for lunch and a tour of the Saugatuck/Douglas area. As we indulged in pie and wine tasting (not in the same sitting) the group continued to still talk shop. Even though we weren't in a session learning technique or plot development, we were still exchanging ideas and fostering one another's creativity. In was nice to see the camaraderie and support that had developed amongst the group in such a short period of time. On the last day, as the group sat and had their last tasty Twin Gables meal, we had the pleasure of hearing from the founder of Chick Lit Central, our very own Melissa A., via Skype. She talked to the group about the history of CLC, the role it has played in the Chick Lit arena and also various tips on blogging and blog promotion. It was truly a treat to hear from her, and appreciated by all. After taking a bunch of pictures, the group parted ways and headed home taking with the knowledge had acquired over the past couple of days with them. As I made my way home, and my dream was coming to an end, I thought about what I had experienced. It was truly a unique dream. Once again I was in awe; however, it wasn't because of a picturesque setting. This time my awe had to do with Wade and Gary's willingness to take time out of their busy schedules to not only share their knowledge with aspiring writers, but to also give them immense support and encouragement. Almost a month later, and I still feel as though my dream really happened...I even somehow managed to get a really nice tan in the process. I liked reading your "Dream" post. What fun and a tan to boot all in a good way. Thanks for sharing! Keep the writing coming...can't wait to read where your next dream happens.